If Blake's vocal style is hard to measure on this side, you need only turn the record over to understand what he, Sam Phillips and Jack Clement had in mind. "Please Convince Me" is a pop record by any standard relevant to 1957. From the piano triples and "doo doo wah" chorus, this is white pop music, and a pretty trite example at that. The last eight bars tell you everything you need to know about Blake and his roots. When evaluating the gentle acoustic feel of these sides, it's important to remember that Jerry Lee Lewis' "Whole Lotta Shakin'" and Warren Smith's "Miss Froggie" were recorded during exactly the same time period. The first Phillips International release extended the Sun career of Buddy Blake Cunningham. Blake had been last heard from three years earlier on SUN 208, a record most collectors remember with a shudder. The deservedly rare "Right Or Wrong"/"Why Do I Cry" makes most short lists for the least favorite and most anomalous early Sun release. The second Phillips International release was all the reassurance Sun collectors needed that this new label would not specialize in tepid white pop music. This two-sided gen by Hayden Thompson put joy in the hearts of rockabilly lovers and Sun fans everywhere and told an apprehensive world that the wildman, unrepentant rockabilly antics at 706 Union had found a second home. There were now two Memphis labels to watch and collect. Curiously, Barbara Pittman's lone Sun single, issued in September 1956 never had a follow-up, despite respectable sales and media attention. For some reason, Sun never saw fit to follow through on her "female Elvis" image, by billing her as a tough competitor to Janis Martin. 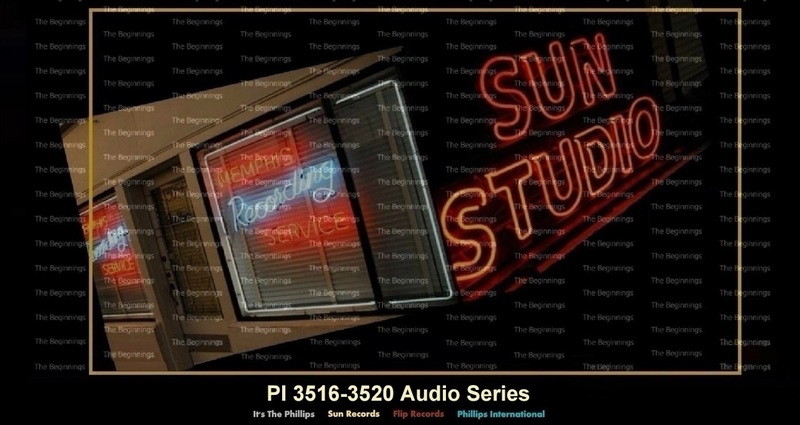 Pittman was no stranger to the Sun studio in late 1956 and early 1957, but no further titles were issued until these sides, both of which are relatively gentle compared to the steaming "I Need A Man" on Sun Records. Here it is, the record that put the fledging Phillips International label on the map. So popular was this disc in 1957 that it inspired cover versions by a host of artists including Ernie Freeman and Billy Vaughn. At one point, Sam Phillips bought space in the trade papers beseeching the industry to listen to all versions and decide which was the original. Sam was on quite a roll in his defense of "Raunchy". He described counterclaims against Bill Justis' version as "uncouth" and went on to talk about the need for originality. He underlined the importance of never becoming "stereotyped and parasitic". Big words for a guy in the record business but he was right about one thing: PI 3519 was neither of those things. In truth, the artist, Bill Justin, was far too hip (and technically skilled) for Sun. His hilarious between-takes exhortations to his fellow musicians are thankfully preserved on tape ("Come on, girls, let's get really bad now so we can sell some records:). In countless interviews, Justis maintained that his technically flawed sax work on this record (which only adds to its zany charm) stemmed from being out of practice. It may have been a mild musical embarrassment to him, but it kept Sam 'n Sun on center stage in the music business. It was surely one of the first instrumentals with a rock and roll sensibility, and as such it led inexorably to the Champs and Duane Eddy and a host of others who perfected the form. Given the rich talent pool on his doorstep in Memphis, it is surprising that Sam Phillips saw fit to sign Texas resident Johnny Lewis Carroll, and its still not entirely clear how or why Carroll made their way onto Phillips' new Phillips International label. Sam Phillips would have been aware of Carroll because he had been on Decca in 1956 and he'd covered "Rock And Roll Ruby". Carroll had also appeared in a sub-B movie called "Rock Baby, Rock It" with another Sun artist, Rosco Gordon. To that point, he had been involved with a Dallas promoter, J.G. Tiger (aka Jack Goldman), and after they fell out he worked the Louisiana Hayride with Scotty and Bill, who had recently quit Elvis. Apparently, it was Bill Black who suggested to Carroll that he contact Sam Phillips, and Phillips bought a four-song session that Carroll had recorded in Fort Worth. This single was issued from those tapes.